“Disruptive” is the lazy journalists' go-to cliché when describing Apple products. So is therefore as good a word as any for this lazy journalist to begin my Watch words. It's also a word that I imagine Apple is happy as a pig at a poo party to be so regularly associated with. Of course we can throw the D-word around with gleeful abandon when discussing its big ticket products. Apple changed the world and turned around its fortunes with the introduction of the iPhone in 2007, then created a whole, new and extraordinarily profitable sector with the iPad. It's been making the best laptops and desktop PCs in the world for years, for just the price of a serviceable second hand car. But of course, it's also had its fair share of clangers. The Cube was a handsome desktop PC with revolutionary, designed-in air cooling that negated the need for a fan. Only of course, it transpired that it really needed a fan, resulting in it overheating and cracking of the housing. The ice hockey puck was a mouse with as much usability as shoes made of crisps. And let's not talk about the over-stuffed UI disaster that iTunes has been stinking out the world with for the last few years. And slap bang in the middle of that pendulum, is the Apple Watch. And while these internetty opinion pieces are supposed to be furious clickbait, hubristically calling out the most profitable company in the world for their rank idiocy while carefully tuning the language for SEO success. But sorry, this isn't it. Because the Apple Watch is… well… it's nice. It's a thoroughly nice product that does some things well. And others not so. It's the tech version of a pair of chinos. A Kia Sorento. A John Lewis own brand kettle. Well made. Polite. Inoffensive. I do know a bit about watches. I'm not an expert, but I'm not a woob or wirgin. I own a, admittedly unimaginative, TAG Heuer three-dial Monaco chronograph, a TAG Monza and a Rado Sintra chronograph, all purchased in America to take advantage of exchange rate fluctuations. And because you can get a deal in a swish American watch store. Ask for a better price in a UK outlet and the assistant will look at you like you've just curled out a bronze onto their floor. In America, you ask for the best price, do some scribbling on some paper and walk off with a proper deal. I like watches, then, but I'm neither a collector, nor rabidly obsessed. Plus, at well over 50, I'm old. So an Apple Watch's ideal demographic, then. This isn't a critical conversational cul-de-sac, though. There really is a lot to like about the Apple Watch. As with all Apple tech, it's very nicely turned out and feels like a premium product. Changing straps is an almost sensual experience and has been thought through excellently. The haptic buzz when you receive a notification is subtle and perfectly weighted. I don't ever have the audio ping on because there's simply no need and it's too intrusive. Plus, audio pings seem, well, rude and shouty. Charlie Sheen would have the audio ping on. That dentist who shot Cecil the lion, also. 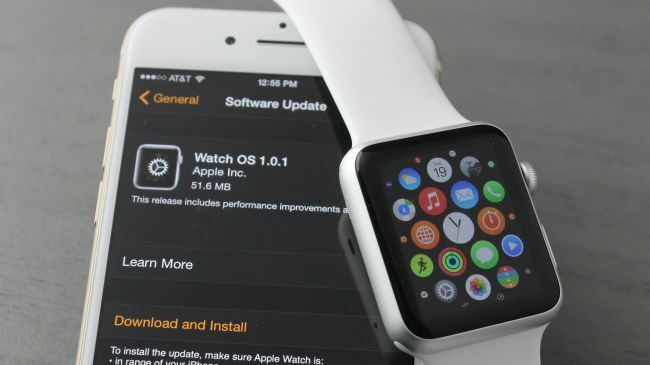 Is Apple Watch a social animal? Interesting, counter-intuitive point: I've experienced a strange and baffling opposition to Watch-wrangling in polite gatherings. Pull your phone out of your pocket to check a Whatsapp you've just been sent and no-one bats an eyelid. Phone prodding mid-conversation is now natural and accepted. Start tapping on your Watch mid-chit chat though, and there's all sorts of tutting, frowning and eye rolling. People think you're a show off and a berk. This makes no sense. Human beings are weird. Moving on, the Watch does notifications incredibly well. You can customise your notification experience excellently, getting exactly what you want and only what you want, moving to a “glance” if you fancy, pulling your phone out for a more thorough investigation or just ignoring and dismissing. Simple. Effective. Bravo, Apple. Get a text or email and responding with voice recognition is almost flawless. Yes, there's the odd misstep, but generally, answering with a simple sentence or two is intuitive and delightful. And finally starts to usher in an era hopefully when talking to tech isn't like talking to your nan. If the car industry, where voice recognition is still fairly dreadful, got onto this, it could be big. Apple Pay on the Watch is nothing short of terrific. Breezing through a London Underground gate with a tap or ordering your wankichino in a second without having to pull your wallet out is seamless and convenient. If you have your Watch on you can pay for stuff. This feels truly modern and genuinely cool. See also unlocking hire cars with your Watch, opening hotel room doors with your Watch and rushing through airport gates like Posh Spice, only less sullen. All utterly brilliant. Apple's much maligned (and admittedly still a light year away from Google) Maps service has found an adept home on the Watch. Voice up your destination and it subtly navigates you there with zero fuss via a succession of wrist buzzes. It's the first thing on Apple's Maps that have worked seamlessly and hints to a future where Google Maps may no longer hold hegemony. Plus, we tech twits were absolutely convinced, totally positive that the battery would be rubbish. And it's really not. You get a day of juice every day no problem, then plug it in at night when you plug your phone in. Even your mum could manage that. And if you forget, 20 odd minutes of charge will give you your full day of pings, buzzes and hollers. Time will tell about degradation and/or swapping. But right now, the battery is as much a non issue as USB-C.
What's the fitness stuff like? Health works. When reviewing wearables, I often run with a standalone, bespoke heart rate monitor and the Watch is never more than a BPM or two outside what the plastic pebble gathering breast plate sweat reckons. My only critique is that I run with the Watch app running alongside the Nike+ Running app, and get two completely different distances from two apps accessing the same GPS data. Weird. Then, of course, there's the flip side. The face is too small to be a successful input device so, for one reason or another, gaming on the Watch is uninspiring and unspectacular. Although a device with internet access, GPS positioning, notifications and a heart rate monitor must surely, at some point, spawn some utterly groundbreaking and yes, “disruptive” games and experiences. The potential here is legion. Clever people, make this happen! The Watch faces are disappointing. This is one area that a smartwatch should utterly spank traditional watches, so to only have 10 faces at launch with none that could be properly personalised was an uncharacteristically short sighted move for Apple. Then WatchOS2 added faces plucked from your pictures, and the welcome ability for third party apps to add notifications to faces, but didn't put the two together. So you can have personal pictures on your face, but no notifications. One, or the other. Which is absurd. WatchOS2 was a strong addition to the Watch's functionality. Personalised faces finally made the Watch a more human, personal object. Complications that could pull information from third party apps and launch them from the Watch face was sweet, as was Time Machine – going forwards and backwards in app data to see tomorrow's meetings or weather is smart and impressive. But so many of these new features were face palmy obvious and inexplicably absent from the first OS iteration. Siri still doesn't work. Is Siri ever going to work? Sending your heartbeat is just a bit creepy, and likely something you'll do only once. Twice, tops if you get a new girlfriend who, statistically speaking probably won't, but just might have an Apple Watch. See also sending a poorly scribbled picture, even in fancy new colours. The games are a total dead loss. And the apps are pretty tragic, too. Apple loves to tow the “never mind the quality, feel the depth” line at key notes, but have you noticed all the “10 best Apple Watch apps!” and “10 best Apple Watch games!” round ups are usually pretty generic? That's because after the first 10 good'ns, find an 11th, 12th etc gets incrementally more difficult. Not giving app developers access to the Watch's microphone, speaker or heartbeat sensor was strategically inept. These are the features that arguably add the most value to an app, so to launch a product walling your most important partners off from this aspect was a strange business decision and has directly resulted in an uninspiring roster of apps. More importantly, there's not a single “killer app” to entice nay-sayers. But then non-nay-saying users bloody love it. A survey of 800 Apple Watch owners done by Wristly handed it a 97% satisfaction rate, putting it past the iPhone and iPad at this stage in their product cycles. Tim Cook happily crowed about this in a recent earnings report. But the piece of paper with the sales figures must have fallen out of the sheaf, as we're still waiting for them from Apple… Which probably tells its own story. However, that over 97% of Watch owners have already updated to WatchOS2 also tells its own story: one of rare commitment and loyalty. I purchased the £330, 44mm Sport Watch with space grey aluminium case and I'm reasonably happy with my purchase. I wouldn't level up my Watch game to the swisher, erm, “Watch”, even though at launch I desperately coveted the space black stainless steel case with space link bracelet in a manner entirely inappropriate and unseemly for a man of my years. I went for the cheaper one because Apple won't be able to help themselves and there will be the inevitable Watch 2 shuffled in, in a short stretch. It's unlikely we'll see the 'phone-and-'pad yearly cycle, but I know that soon enough I'll be looking at a new Watch on a fellow commuter and feeling envious and a little bit cheated. Three hundredish pounds every 2-3 years feels like an investment I might be prepared to make. Any more and I'll feel like an exploited twerp. That's why I judge the Watch Edition to be absurd, in my angry, fist shaking, opinion piece-y way. Here's another thing. Whenever I've strolled into the office with the latest iPhone, iPad or Macbook, I've attracted a gaggle of coo-ing and aah-ing colleagues keen for a prod and a listen to my jawing on about it. When people see the Apple Watch, I get an eyebrow raise and a, “What's it like?” “It's okay,” I say. And we move quickly on. It just doesn't generate that cachet that Apple's sexier products do. Millennials, that elusive population bracket that oily marketing snakes have sleepless nights and trouser tenting about never got around to owning watches. At all. They didn't have one, they didn't have one, then they owned a smart phone. Or if they did have a watch, it would be a £25 Chinese nothing that they neither loved nor noticed. The average age of a brand new Honda Jazz car buyer in the UK is 63. The Apple Watch feels similar. So in conclusion, the Apple Watch is a perfectly serviceable thing that does some things well, and other things not so. I like it when I wear it, but equally I don't miss it when I swap it for a grown up watch in the evenings and weekends when I don't want to be bothered every five minutes, even if I do experience phantom kicks and buzzes, a bit like an amputee feeling an itch in a limb they've lost. If I lost my Apple Watch, I'd be reasonably bummed, but I'd get over it. If I lost one of my TAGs or Rado, I'd be inconsolable. It's the best smartwatch out there by some margin – look at the Watch's competitors and it's a bland line up of middling products that are shuffling uncomfortably, not really knowing why they're there – but that's a bit like being the best cufflinks, sock suspenders, or monocle. In my more doubting moments, I feel as if, with the Watch, Apple has wasted its marketing and design genius on something meaningless. It's like it put out a wonderfully designed, stainless space steel, impossibly efficient mangle. Or the world's most beautiful TV aerial. In my less doubting moments, I feel as if the Watch is a quite nice thing that nobody quite needs. Maybe that's worse. I'm a tech writer with a limited range of, relatively cheaply-bought, opinions; Apple is the richest company in the world, hiring the smartest minds at the premium that demands. Whether it can figure this particular condundrum out, though, really remains to be seen.